At the bus stop recently there was a poster advertising some sweets called Rowntrees’ Randoms. 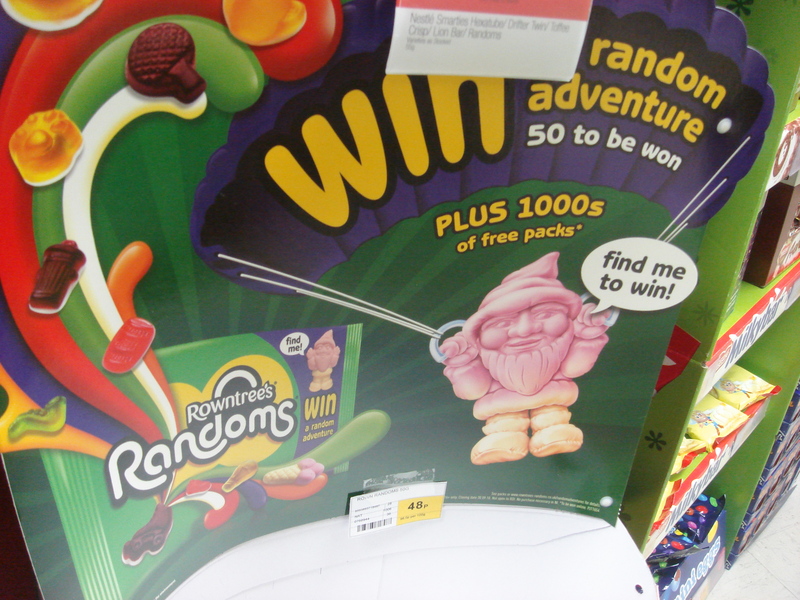 If you buy the sweets you might win a random adventure. Others have observed it far more eloquently than me, that these adverts are not just selling stuff, in this case sweets, but a life style (See the TV. series The Century of the Self). These sweets are for random and quirky types who aren’t influenced by adverts, they make their own choices. It occurred to me that some people really want to win these competitions that winning a competition makes a dream become a reality. Someone else will look after you, provide a reality for you. I always wanted to win something like this when I was a child, not just because of Charlie and the Chocolate Factory, but because some of my reality was lived out through product related media. Things like Coca-Cola and fruit pastilles were a real and important part of my world. The advert is a kind of message from someone, and it appears as if they care. I’m pretty sure they don’t. Compare this to Batailles’ interpretation of the cave paintings at Lascaux. He sees the marks on the walls as distant messages, akin to friendship, reaching out through time with warmth and humanity. The two images communicate very different things on the surface but both relate to public-private modes of communication in different ways and for different purposes. In the caves what was made in the dark was part of a sacred ritual meant only for a few. Now they can be seen by anyone, yet we don’t fully understand what they are or who made them. Clever adverts tap into our deep-rooted, subconscious desires and are designed to be seen by as many eyes as possible. 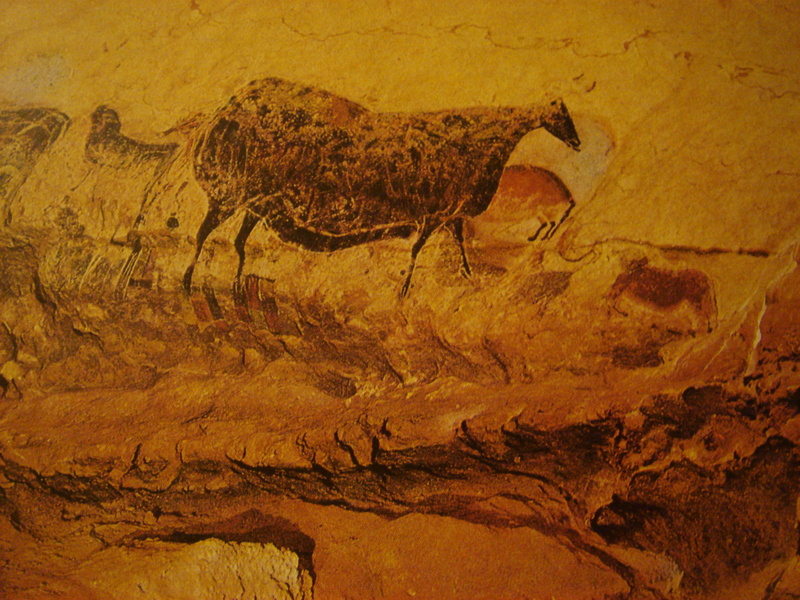 Its all secular and democratic yet it feels so wrong compared to the secrets of Lascaux. We used to put our dreams and desires into the hands of a Shaman, his was the world of light and dark, illumination and ignorance. He read the signs for our ancestors, the world was full of them, now its full of adverts. ‘As a possibility and thus perhaps a necessary commitment’, Benjamin said this of Zionism in 1913- I might say it of him. Alethia- visually perceptible to the eyes of the mind and comprehended to us as ‘un-concealment’. Alethea was my grandmother’s name. I opened up an old copy of frieze magazine recently and flicked through. It was issue 112, Jan-Feb 2008. On page 15 was a new years quiz. This was question 4..
On the 16th of November last year I sat in the Library with Illuminations, the collection of Walter Benjamin essays. It took me almost two hours to get half way through Hannah Arandt’s introduction. This first reading is initiatory. I read, I noticed, i made notes, copied out whole chunks, but very little commentary or analysis followed. It is a dull, though I suppose, normal starting point. When you meet someone for the first time sometimes you notice without judging, so keen are you to find what you are looking for in them. The most interesting thing that I wrote in my notebook was.. While in the library. In the cubicle to my left is a student. He is making notes-copying notes onto a small whiteboard using a green board pen. He writes, then reads, then wipes the writing off the board. the green ink is turned into tiny particles that cover the paper he wipes with and flake around the edges of the board. The ink into words into matter-and into memory.